By now you are likely to have heard of the many benefits of being grateful. You will experience more inner ease, notice more good moments and be able to connect more easily to others. Not bad. However, it is not enough to have a gratitude journal or casually identify what you are thankful for. 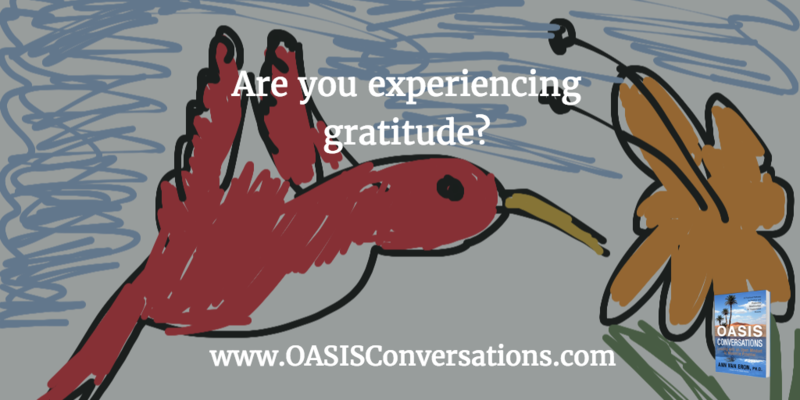 Ideally, you build the habit and neural pathway of noticing and expressing gratitude. You will benefit from actually experiencing gratitude in your body. For example, you will feel warmth in your chest or heart area as you are grateful for a child or friend or a job. Too often, we focus on what we don’t have, or what could go wrong and we experience more fear and anxiety. We need to build the habit of experiencing gratitude. This is especially important during these periods of unprecedented disruption and change. This means continually noticing and appreciating the good around us. Our emotions are contagious. As leaders, we need to positively influence and support others. I will never forget waking up one night and experiencing gratitude for my life rather than my old pattern of worry and fretting about what I need to do and what I don’t have. I developed the habit of being grateful and it made a big difference for me and those around me. Try an experiment of loving your life and being grateful for all you have. We forget to appreciate the abundance. This becomes clear to us when we see others who do not have enough food, friends, money or a home. Really allow yourself to focus on what you do have and experience gratefulness. Let me know how it goes. This entry was posted in intention, Mindfulness, Mindset, Perspective by Ann Van Eron. Bookmark the permalink.